Our design solutions help companies leverage the benefits of the controller chips to improve performance, reliability, scalability of design and cost of embedded devices; accelerating the development cycle, reducing time-to-market and staying ahead of the increasing competition in the market. We have experience designing fully functional electronic modules built around various kinds of microcontrollers. We have successfully designed systems based on ARM7, Cortex M0, Cortex M3, ARM9 cores from different vendors. 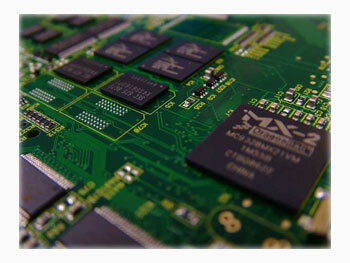 We have designed solutions based on controllers from NXP, Freescale, TI, Renesas, Microchip and Fujitsu. After the initial requirement analysis, our design engineers work very closely with the client and provide timely update on the process to our customer. CoiNel understands specific needs of customers and takes complete responsibility of designing an entire hardware module ensuring quality standards and delivery schedules. All development stages are additionally analyzed by the technical experts, which minimizes error risks. We have experience in designing digital and digital-analog designs based on modern electronic components. We have designed microcontroller based systems, and have undertaken implementation of high-speed interfaces (Ethernet, USB, PCI), integration with wireless data transfer modules (WiFi, ZigBee, Bluetooth, GSM/GPRS) and other hardware interfaces. Designed systems based on CAN, RS485, MODBUS, I2C, SPI, Serial and many other communication protocols. The GUI in such devices are implemented on graphical LCDs, high-resolution LCD (TFT, STN, sensor panel) and remotely via a Web-interface. Mobility and portability are ensured through effective energy saving modes. Products designs by us are currently being used in data process industry, data acquisition, telecom, medical equipments, Point of Sale, Transportation etc. We can quickly put together a working model (a prototype ) in order to test various aspects of a design, illustrate ideas or features and gather early user feedback. Prototyping is often treated as an integral part of the system design process, where it is believed to reduce project risk and cost. Often one or more prototypes are made in a process of incremental development where each prototype is influenced by the performance of previous designs, in these way problems or deficiencies in design can be corrected. After sufficiently refining and meeting the functionality, robustness and other design goals, we further proceed with manufacturing. At CoiNel we have our labs equipped with necessary tools to do the assembly and testing to create a prototype. We undertake orders to manufacture self designed products or take the production orders of third party design. Apart from the PCB manufacturing, done with our reliable partners everything else is done in-house. The designs done by CoiNel takes into account all the necessary certification like EMI/EMC etc required for the product and also goes through qualification tests at the reputed labs in India and abroad.